So… I was looking through Instagram the other day and saw the most adorable hat, it had sheep on it! 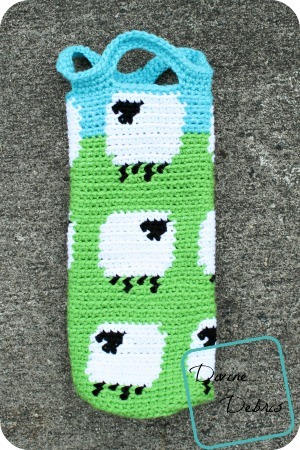 And my first thought was, “yeah, I need to make something with sheep,” and so I set out to make this pattern. 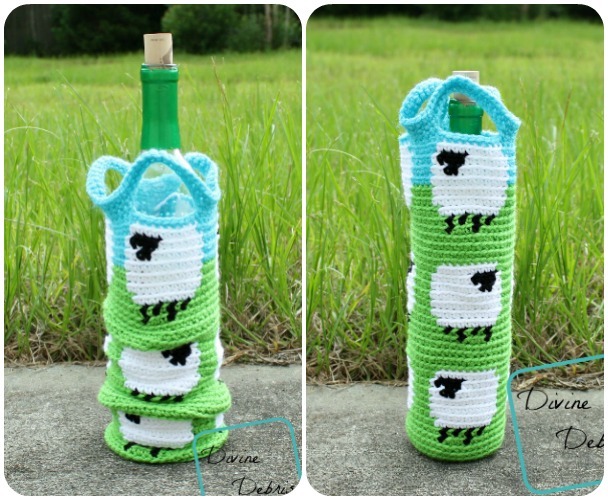 So, I decided to make another wine bottle cozy because it’s been a while since I created the Willow Wine Bottle Cozy, so I decided to make another. 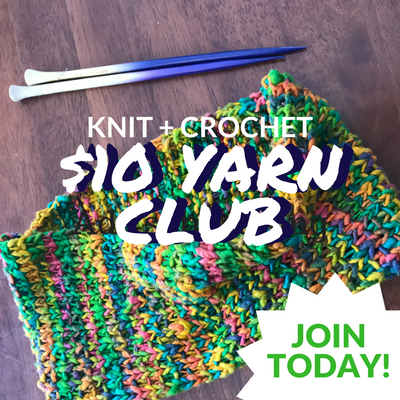 Honestly, this is a pretty quick pattern if you like tapestry crochet and it’ll be a great gift or holder for a great gift for that fiber lover in your life. 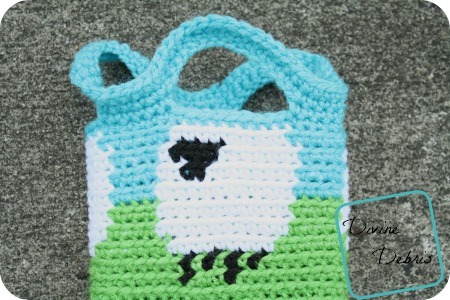 If you appreciate my weekly patterns, please consider purchasing the Shelia sheep Bottle Cozy pdf in my Ravelry shop for $1.50 to help me bring more patterns to my blog. 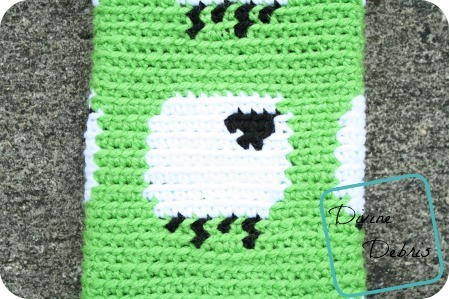 The pattern is worked in the round with a slip st into the first stitch into the last. 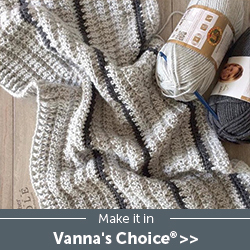 You will need to know how to work into the back loop only for this pattern, the sides are worked into the back loop only. This pattern is worked from the bottom up, working the base flat, then building the sides and then topping it off with the handles. Color A is green, Color B is black, Color C is white, and Color D is blue. Your base should 3.25″ in diameter at this point. All the stitches in the side will be worked into the back loop only. All of the stitches in the sides portion only tell you how many stitches to do in what color, this is what the number in the parenthesis means. The first st is worked into the same st as join. 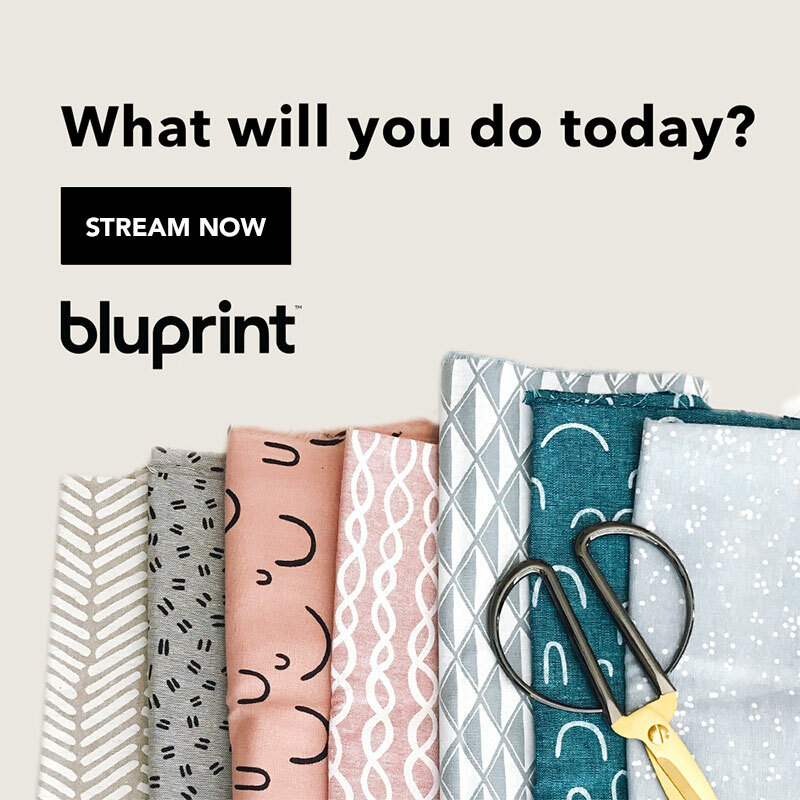 The post is linked to Hookin’ on Hump Day #120 and Linky Ladies’ Community Link Party #55. This is adorable! Now at the top of my ‘to do’ list!! What am I missing? When I got to row 13 I only get 36 st rather than 45, and I believe 14-16 only have 34 st. Help! I would also love chickens-but the sheep are adorable. I don’t drink but I always have grocery bags and need a bag holder! I will improvise and make it that! Thanks!